The third annual Stoneleigh school-wide artist in dance residency program will run from October 29th through November 9th. This year students will dance to the beat of various decades. 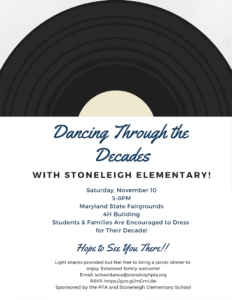 The residency will end with a culminating “Decades Dance” on Saturday November 10th from 5:00-8:00 p.m. The Dance will be held in the 4-H Home Arts Building at the Timonium Fairgrounds. Students in grades KG-5 will perform many of the dances they learned during the residency. You will not want to miss this wonderful community event! Light refreshments will be served, but feel free to bring a picnic meal for your family. There will be seating available. *Please consider volunteering to help out for the event by heading to our volunteer sign-up page. school lobby the Monday after the Winter Craft Fair. Please keep in mind that delivery will still be later that same day. 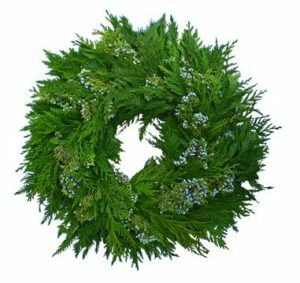 Fresh Wreaths are available in Mixed Evergreen (the 2017 customer favorite!) Red Cedar/Berried Juniper mix, Boxwood, and Douglas Fir. 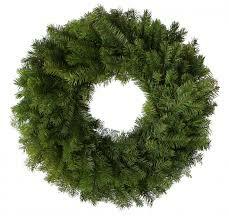 The 18” are perfect for windows and the 24” and 32” wreaths make a very festive statement for the front door. 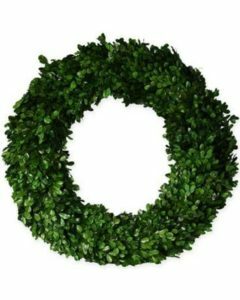 Roping, for inside or outside use, comes in White Pine (25ft or 75ft), Boxwood (25ft or 75ft), and Douglas Fir (25ft only).White, Red, and Pink Poinsettias are the same price as 2016! In 4” or 6” pots. 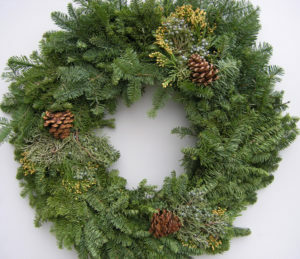 *The new options this year is a 4ft Mixed Evergreen Mantlepiece arrangement for only $35! Orders must be placed by Monday, November 5th no later than 10am. Please specify on your order form which option is best for you. Help us stay paperless and order below today! Any additional questions, please email the Winter Greens Committee! 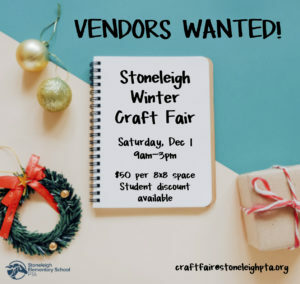 We’re seeking talented crafters for our highly anticipated holiday shopping extravaganza, the one and only Stoneleigh Winter Craft Fair on Saturday, Dec 1 from 9am-3pm. Register Here! Space is extremely limited this year so don’t wait to secure your spot. Regular 8×8 vendor spots are $50 each, and 5×5 student spots are $15. Our market is limited to handmade items ONLY (no MLM’s please). Between the craft fair, greens sale, Cupcake Challenge, and food trucks, we are expecting a ton of traffic so you won’t want to miss this opportunity to market your creations to our amazing local community! Send any questions, comments, or winning Megamillions numbers to Tricia at craftfair@stoneleighpta.org. Collect money from sponsors between 110/5 and 10/26. All pledged money should be turned in by 11/2. Don’t want to find sponsors or collect money? Feel free to just donate directly to the PTA. Pay online at our store, or send a check. We are a 501(c)3 organization so your donation is tax deductible. Thank you! We could not do what we do without your support. 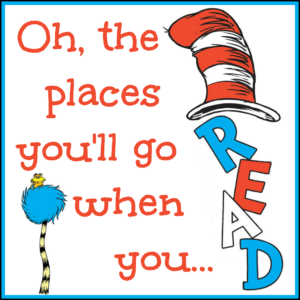 Among other things, your donation helps us produce events like the Stoneleigh All School Dance, host cultural assemblies, provide reading enrichment, and pays for those student planners we all have to sign. Pull ALL THE WAY UP. Like all the way. To the kindergarten doors. All the way to the light post. Yes, even if your child goes in the front door or the gymnasium doors. And yes, even if your child is there early as a safety or morning helper. If you (or your kids) aren’t ready to say goodbye that’s cool, we all have those mornings. Please park in the back row of the parking lot while you wait, not in the Kiss-n-Go line. Parking in the KnG creates a back-up and the unsafe situation of cars pulling around you (and possibly…probably…giving you dirty looks). You shouldn’t have to get out of your car. If you do, to say…unload an instrument, a science project, or a stuffed ostrich for show and tell, you should park in the back row of the parking lot and walk your child (and their ostrich) in. Your child(ren) should get out on the passenger side of the car (which you have pulled ALL THE WAY UP). They should NEVER EVER get out on the driver’s side. Like, ever. The KnG is staffed from 8:30-8:45 by some of our lovely teachers. They are there to make sure your darling gets out of the car and safely to the building. However, your child can open the door and exit on their own as quickly and efficiently as possible, and is encouraged to do so. And you are encouraged to feel confident your child will get in the door without actually seeing them walk through it. Please stay off your phone until you are completely out of the parking lot. It just makes everything easier and safer. Please maintain a single line through the parking lot. We know it is frustrating and that you are in a hurry (everyone is in a hurry), but safety dictates you not cut through the aisles, especially in the wrong direction. Speaking of the wrong direction, it’s really not okay to pull onto Pemberton from Copeleigh to sneak into the parking lot. Not only is it unsafe, it’s definitely illegal. But also unsafe; we will start ticketing soon if this continues. Finally, and we really want to stress this: please pull all. the. way. up.